1 12 / the tasting panel / september 2017 BRAND SPOTLIGHT W hat do you get when you combine hallowed vine clones matched after years of research with the ideal vineyard sites, then hire one of the most distinguished experts in grapevines and viticulture to manage them? A Noble collection of wines, including the original clone that started it all—the 93-point Noble Vines 337 Cabernet Sauvignon. The best way to preserve the characteristics of a grape variety is through cloning. Simply put, a piece of the "mother vine" is either planted directly into the vineyard or grafted onto another vine. As a result, a new plant is created that has the same attributes and characteristics as the superior grape vine. 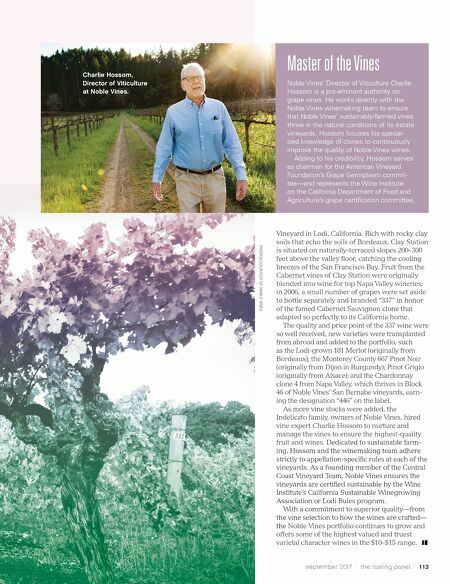 For the collection, the winemaking team at Noble Vines took the finest time-honored vine selections, such as clone 667 Pinot Noir from Burgundy and clone 337 Cabernet Sauvignon from the grand estates in Bordeaux, and planted them in California locations where these special vines thrive. Consequently, wine consumers can then get the truest varietal flavors from the great vineyard estates' vine selections at an approachable price and availability. 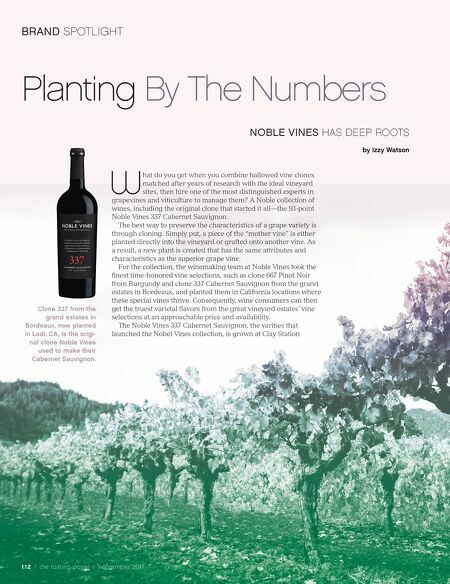 The Noble Vines 337 Cabernet Sauvignon, the varities that launched the Nobel Vines collection, is grown at Clay Station Planting By The Numbers NOBLE VINES HAS DEEP ROOTS by Izzy Watson Clone 337 from the grand estates in Bordeaux, now planted in Lodi, CA, is the origi- nal clone Noble Vines used to make their Cabernet Sauvignon.